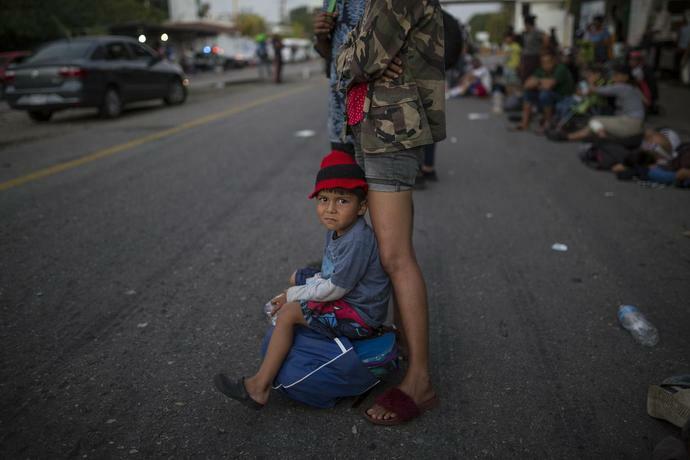 NILTEPEC, Mexico (AP) -- Toddlers slump in strollers bouncing across the rough asphalt, and infants only a few weeks old jiggle in their fathers' arms. Others, limp from exhaustion and nearly too big to be carried, are slung across their mothers' chests like sacks of grain, sweaty hair plastered to their heads. With Tuesday's U.S. midterm elections just days away, President Donald Trump has continued to ramp up his rhetoric against the caravan of some 4,000 migrants, repeatedly hammering Democrats and talking of sending as many as 15,000 U.S. troops to the southern border - more than double the number of migrants in this group and three other much smaller ones following in its footsteps hundreds of miles behind. Unless they unexpectedly find some way of traveling faster - and Mexican officials have shown no inclination to facilitate that - they are still weeks away from reaching the U.S. border. Thousands have already dropped out, applying for asylum in Mexico or accepting free bus rides home, and many more are expected to do the same. A caravan earlier this year fizzled to just about 200 who actually made it to the Tijuana-San Diego border.